Salt Lake has some of the greatest finds. The downtown library is the best for this. Look at the ground. If you see a piece of paper that resembles trash then pick it up. You will find treasure more often than you think. These are two of my latest finds and I can't wait until I have a business card of my own to hand out or drop on the ground. What should it say? How much information should I put on it? Where do I get it printed on slick black paper with gold embossing? It looks very expensive. Very elegant. Very fancy. Very very. How do I get an exclamation point behind my job title? Do I need a Ph.D. or can anyone have an exclamation point on their business card? P.S. 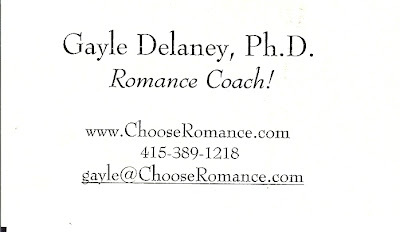 For an added giggle or to find the love of your life please visit http://www.chooseromance.com/ and please do not forget to click on the about Gayle tab. I definitely want her sitting around the corner on a awkward lunch date jotting notes and pretending like she isn't listening in. I WOULD BE SO MUCH BETTER THAN GAYLE AT THAT! Seriously. I am a great life coach. Visit www.ineedalifeplan.blogspot.com for more information. Looks to me like Gayle choose Glamour Shots! 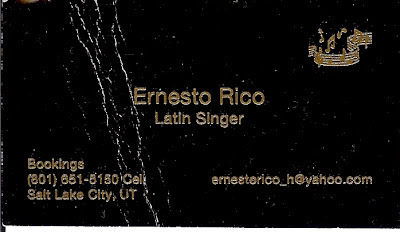 We must, must, must hire Ernesto for as a 50 B-day surprise for Dad. He deserves it. Zach thanks so much for the tip off for your christmas gift! i saw that they have gift certificates for my discouraged friends!!! I just tried to call you...but I realized it is barely eight in the morning so...That bakery is SO cute. I thought they had stolen my name (I want something Sugar Cube---like Sugar Cube Confections or the like---)The front window picture said Sugar and what looked like cubes and I was like "NOOOO!" Let me know what pictures you want TODAY because I'm getting a bunch printed for this weekend so let me know ASAP and I'll get you a couple. Wait. You're allowed to do that?